dance.net - BRAND NEW dress - motivated seller!! $850 (10240227) - Read article: Ballet, Jazz, Modern, Hip Hop, Tap, Irish, Disco, Twirling, Cheer: Photos, Chat, Games, Jobs, Events! This dress is BRAND NEW and only worn for a few minutes to try on for size. Very unfortunately for us, my daughter is growing at an insane rate and the only measurement that is the same as when she was measured is her waist. 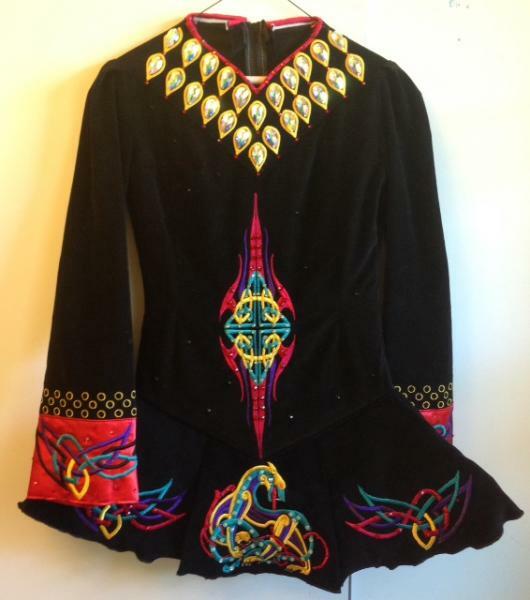 Black lightweight velvet with celtic embroidery, large Swarovski pears at the neck, and red satin cuffs that really bring out the color. We love this design but there is no way she can wear it. Need to sell to help buy another one before NANs. No reasonable offer refused! Measurements lying flat: chest 35, nat waist 29, hip 35, length 31. Please let me know if you'd like more measurements or pictures. Thank you! Dress has been reduced to $750. Entertaining all reasonable offers! !